PeapodLife: Rainforest Ecosystem Greens Café at 401 Bay! Shared Office Space Abuzz with Orchids, Moss, Bromeliads, Waterfall & More! Rainforest Ecosystem Greens Café at 401 Bay! 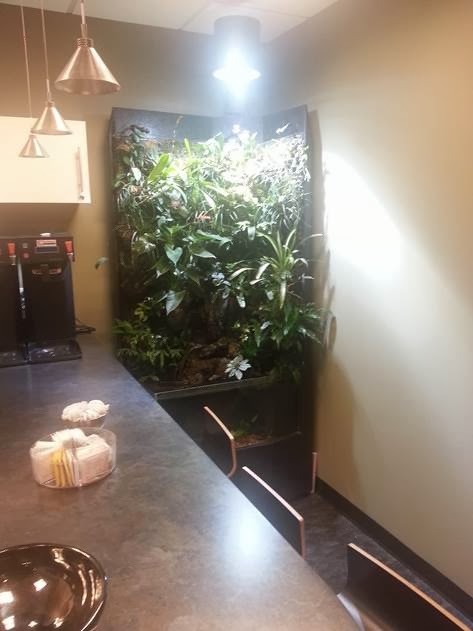 Shared Office Space Abuzz with Orchids, Moss, Bromeliads, Waterfall & More! These are just a sample of the comments we’ve been hearing from occupants of 401 Bay Centre, 401 Bay Street, Suite 1600, Toronto, Ontario M5H 2Y4. The shared office space on the 16th floor has caught ecosystem fever since we moved a special Angolo unit into their café. Really? Doesn’t look like much to me…what’s all the fuss about? Pictures really cannot do our ecosystems justice. Like any experience of nature, you’ve got to experience it for yourself to really appreciate what all the fuss is about. The good news is, you can experience it for yourself. More on that later. In the meantime, let us share with you that we have had nothing but positive feedback from everyone we’ve spoken to at 401 Bay Centre since the installation of the ecosystem. All this is well and good, but it’s still not literally green. Marnie Walker, Owner of 401 Bay Centre, fell in love with the ecosystem. Having a truly green addition to her shared office space environment seemed like a no-brainer, considering her love of plants and her passion for all things green. What Can the Companies at 401 Bay Expect? While impossible to predict exact outcomes, what people at 401 Bay can expect is the calming yet invigorating effect the ecosystem has on them. Whenever they need a break, they can go to the café and chill out in the company of a high order rainforest ecosystem. Lush foliage. Bright colourful orchids and exotic flowers. The soothing sounds of water running down a real rock waterfall. Freshly minted oxygen bellowing off a rainforest living wall unlike any other: with no plant replacement costs, no chemicals or fertilizers of any kind added. Just nature in her highest expression…beckoning for you to achieve your highest expression. Nature at its best and most balance, filling the room with that same vital energy, doing everything it can to help you be the best, most balanced and alive you can be. Just imagine having a space like that in your office. Why Should Bay Street Care? Companies are a reflection of their people. Their strategies and decisions at the top reflect the well-being and clear thinking of their leaders. Leaders rely on the efforts of all those who work for them. An unhealthy, disharmonious office environment can produce neither a healthy company nor a healthy bottom line. Sure, you might have a great quarter. You might even achieve year over year earnings growth. But this doesn’t necessarily mean your company is healthy. Health denotes long-term strength, resilience, and organic growth based on real-world performance in the macro-environment. Attrition, cost-cutting, down-sizing, accounting tricks, financial wizardry, and a myriad other ways in which companies (especially publically traded ones) meet the incessant need of the markets for bottom-line growth are to business what steroids are to Olympic athletes. It’s simply not sustainable, period. What can an ecosystem do to change business as usual on Bay Street? It’s quite simple, really: an ecosystem helps create an environment of health and harmony within your company. Forget structural changes, we’re talking about an explosion of opportunity at the very heart and soul of your enterprise. Your people perform better. They align their thoughts and ideas about how best to move forward with ideas that come to them more often in more profound moments of inspiration. Nature can do that; our ecosystems can do that. You’ll invite more clients/partners/suppliers/government officials/media to come attend meetings in the company of your ecosystem. Those meetings will run more smoothly. You will find yourself more productive; more resilient; more able to handle whatever fires need to be put out today. And yes, you too will feel the power of the rainforest ecosystem’s infinite energetic balancing capabilities to relax you, invigorate you, and inspire you to incredible new courses of action for tomorrow. Can I Experience it for myself? Yes! Contact PeapodLife at info@peapodlife.com today. Tell us a little about yourself, your company, and what intrigues you about having an ecosystem in your office. Don’t forget to leave us a number where we can reach you. We’ll call to arrange a viewing. 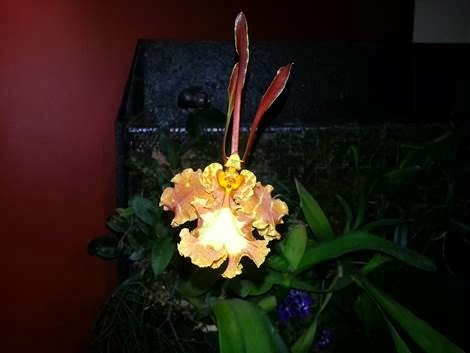 Your company is about to go into full bloom.